Expand your mind for a moment and think about this picture you see. 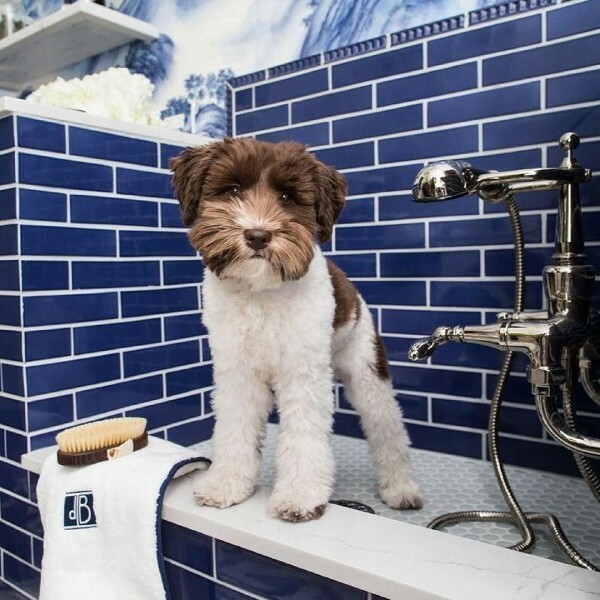 Your precious pet has a new doggie wash location with beautiful tile and grout in your redesigned 2018 Utility Room. Welcome to the evolution of the Utility Room for 2018. And what about that beautiful simple tile and grout…It is spectacular really. Who would have thought that a usually mundane chore could be so fun. Meaningful experiences with a newly designed utility room for your home, vet clinic is a great way to make an investment over the life of your home or business. Even if you are on your third load of laundry or cleaning mud off of precious little paws, it is time that you and your family create a beautiful and functional space that makes your routine smoother and more enjoyable. Say Goodbye old mudroom, welcome and discover the freshest ways to upgrade your utility room to make the hub of your home feel more calm, sophisticated and balanced. Keeping that in mind, Keith Clay Floors in Dallas, would like you to consider another focus of maintenance on the tile you see in this picture. The color variety of tile which is a dark navy blue is huge. The simplicity of using the bright white grout in this setting is distinct, and could also be any other number of bright colors including red, white, orange, black, and terra cotta to go with your stylish decor. To give a pattern some individuality different sizes of tiles or different colors could have also been used to set off this Doggie Wash Station. Lighter shades of tiles will add a look of more room to a small area. Using your imagination in this utility room, the floor with the right tiles will enhance it and add excitement. Tile can also a good material for living rooms and places to gather where there are many pets as well. The qualities of toughness and being durable are part of natural tile floors. Tile accentuates any room with color and pattern. Maintenance of these floors provides you with environmentally friendly options to have ‘Green flooring products’ in your home as well. Personalize With Great New Patterns – Just because it’s the utility room doesn’t mean it needs to look utilitarian. Add a bold, printed wallpaper, accent the room with a pop of one of your favorite colors or even experiment with the stylized backsplash tiles you’ve had your eye on. When you personalize a space with bursts of pattern or color, you’ll instantly feel more excited to spend time there. Consider Creativity – Pamper Your Pet—and Yourself With This Great Pet Washing Station. Once considered a luxury, a pet-washing station has become a staple of the modern utility room. Today’s trending pet-washing stations are an elegant extension of your overall personal style, featuring everything from tiled backsplashes and custom shower doors to stylish handshowers like Flipside Handshowers, Awaken Handshowers, and Artifacts Handshowers by Kohler. Take a good inside look at a well-pampered pet bath in the picture above. An aesthetically pleasing station will delight the humans of your home while the functionality and ease of use will make sure every pet is pampered. Just remember to call Keith Clay to provide you with ongoing maintenance to keep this tile and grout as beautiful as the day you purchased it. Keith Clay has been in business for 30 years serving Dallas, Frisco, Plano, Richardson and all Dallas Metroplex suburbs. We know tile, grout, and mixed stone installations. We can answer any questions you may have. If you want the best job from a company of professionals, call us today. 972-463-6604.